Are you looking for a classy, timeless, yet still fresh and modern theme for an upcoming bridal shower? Look no further! Nashville resident and FYP bride, Anna’s recent Southern Belle Preppy bridal shower hit all the right notes in Music City. Inspired Reese Witherspoon’s new book Whiskey in a Tea Cup and her fab Nashville boutique, Draper James, this bridal shower theme is totally adorable, y'all. 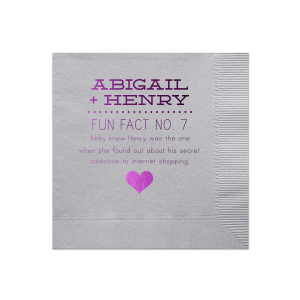 From the personalized bridal shower cocktail napkins to the darling party favors, the custom party accessories added a fun and interactive layer to this sweet celebration. Is it possible for cocktail napkins to steal the show? 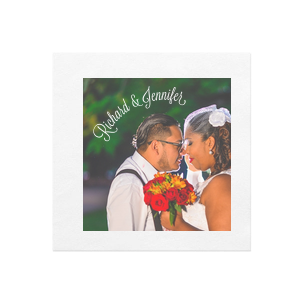 With custom fun fact cocktail napkins AND full color cocktail napkins featuring the lovely couple’s bitmojis in wedding attire, the napkins definitely made a big impression. 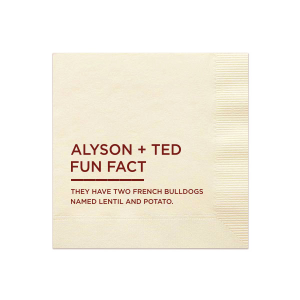 To add either (or both) of those napkins to your upcoming party, how to choose your fun facts cocktail napkins and how to put your bitmoji on your custom cocktail napkins will get you started! A brunch menu of bagels, mimosas and adorable macaroons was a welcomed spread for the party guests, as they celebrated in a comfortable private residence. The bridal shower party favors were tasty treats, wrapped up just right, with a scalloped gift tag foil stamped with southern sayings like “for you darlin’.” Does it get any cuter?! To make sure there were plenty of fabulous photos of the gathering, the hostesses created a comfy photo wall for all the selfies and group shots. This detail is always a crowd favorite, and a great excuse to take lot of pics while you’re looking lovely! Anna’s Southern Belle Preppy bridal shower theme is a great example of taking a favorite of the bride-to-be and creating a perfectly personalized celebration!